2017-2019 Road King Special Road 6 Customs Holey Roller handlebars 15" x 1 1/4" and complete cable kit! These are VERY simple to install! You can do this yourself with basic tools in under an hour! Everything you need to get to is under the speedo/tach so you do not have to remove your fairing! Machined for internal wiring, TBW and deep knurls to keep them from rotating. 6 1/2" pullback for perfect ergonomics! Complete Cable kit includes black cables. 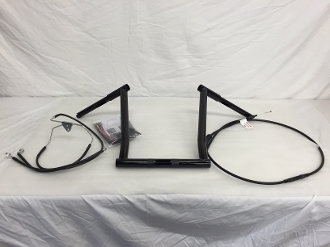 Includes all parts needed to install these bars on your bike. Select for ABS models or NON-ABS models.